Going Green Vacation – Four years ago, my aunt gave my sons tee shirts from Venice Beach in Florida. She told them all about the shark teeth right on the beach there. Another friend saw them wear the shirts and also raved about the shark teeth hunting and beautiful beaches. 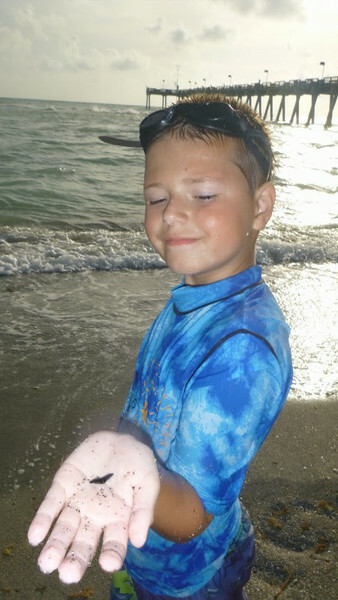 From then on, they always wanted to go to look for shark teeth along Venice Beach in Venice, Florida. At long last, we were going! My boys, now 7 and 8 years old, were thrilled. We booked flights to arrive in Tampa on a Tuesday, and we left Sunday at noon. 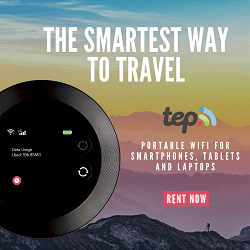 Where to Stay While Going Green Vacation to Florida? We looked online for places to stay. 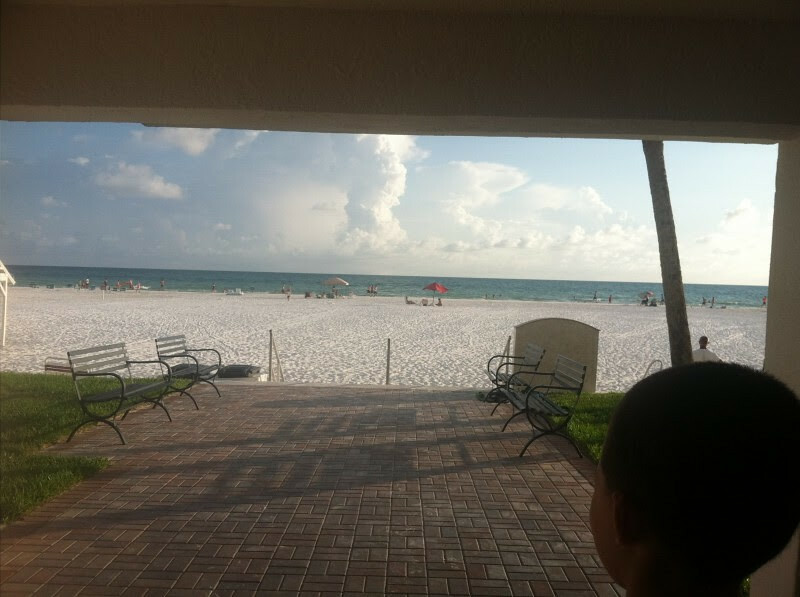 We wanted easy access to Venice, Florida and also wanted to stay as close as possible to the water in case someone wanted to go back to the room and someone wanted to stay at the beach. I am usually a name-brand-hotel-person…I like to know what I am getting. 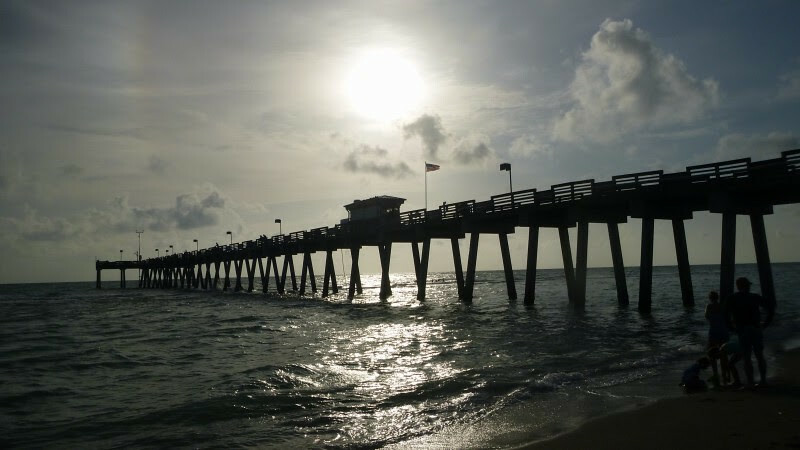 From my online search, I wasn’t able to find exactly what I was looking for in Venice, so I looked a little farther north and learned about the fantastic location of Sarasota – close to Tampa and close to Venice. And it boasted Siesta Key which is known for its beautiful white sand beaches. We found an amazing villa in Sarasota on Siesta Key in a complex called Casa Blanca – C14 Villa Siesta Key. We contacted the owner Teri Evans (262.385.2359 or raccoonbear@aol.com) who was easy and a pleasure to work with. 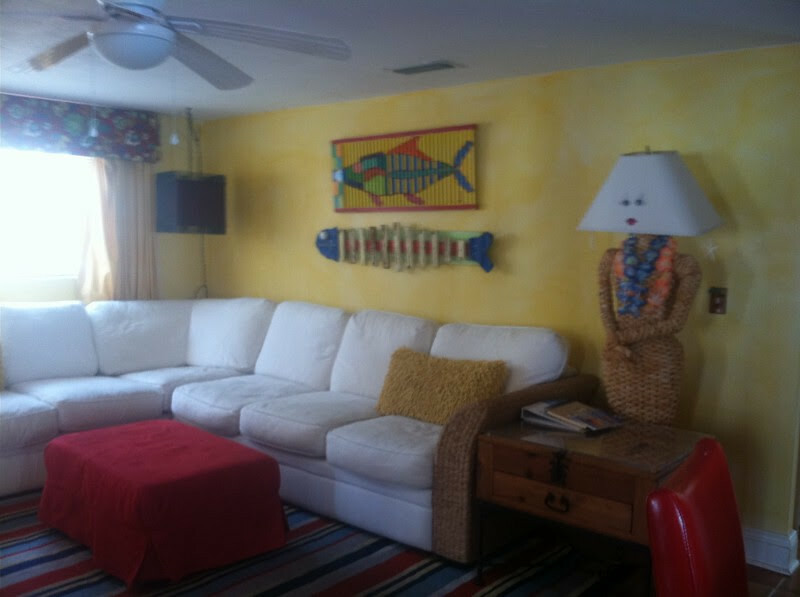 We highly recommend and thank Teri and her Villa C14 for an awesome Going Green Vacation. From what we could tell online — it was decorated so vibrantly with a beach theme — we just had to give it a try. 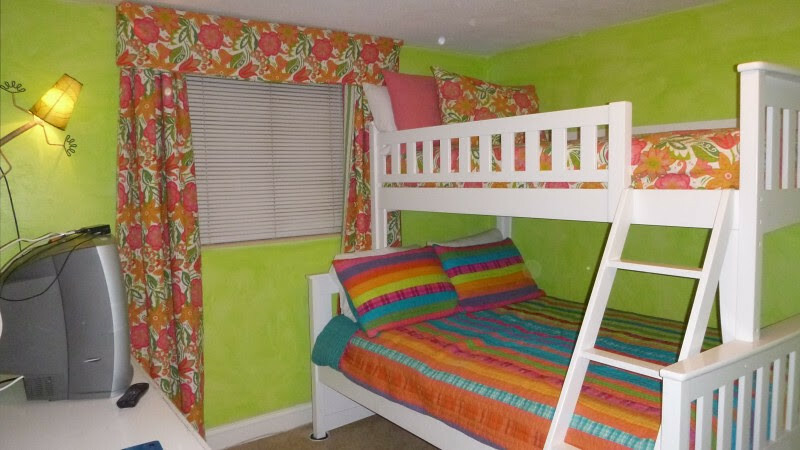 My husband and I loved it, and my sons were absolutely elated with the décor…especially the bunk beds. For days, they continued to be excited about interesting things in each of the rooms. On beach-front property, they counted 156 steps from our Villa 14C to the amazing white sand in Siesta Key on Crescent Beach. This villa was perfect for our family for so many reasons. Yes, it was decorated so nicely which really made us feel like we were on vacation. It also gave us the convenience we were looking for being it was so close to the beach. It was nice to be able to park right outside our covered patio for the times we left to go explore other beaches and to go to town: to buy shark tooth necklaces and get ice cream. There was an updated and modern clubhouse with a television, couches and computer. We went there a few times just to get out of the sun to play billiards and ping pong. Adjacent to the clubhouse was their amazing swimming pool. It was much larger than we expected. We only had time to swim in it once but it was wonderful. I was surprised it was so very clean. I didn’t even see any sand on the bottom! My husband remarked about how much better it was staying in a villa than staying in a hotel would have been. Can you just imagine all of our swimsuits and beach towels hanging to dry? Where would we hang them? Can you imagine all of that sand getting into the carpet and everywhere? In our villa, aka “our house,” we hung our swimsuits in our two full bathrooms and the towels on the drying rack, out of the way in the enclosed patio. We were able to sweep up the sand from the decorative tile floors. And because we had a full-size kitchen, we were able to create less waste, eat healthier, save money (my husband’s favorite ‘going green’), and enjoy the convenience of eating “at home” instead of going out to restaurants all week. It has two bedrooms which would comfortably sleep five people on the beds. There were clean sheets, soap, ample towels and lots of dresser drawers. No shared hotel hallways, elevators or lobbies. No noises above, below or next your room. No housekeeping staff (this is my husbands not mine). Multiple rooms so we can spread out, read, rest, or just have a few alone minutes. How to Have a Go Green Vacation? Even though it is more difficult when traveling, we try to “go green” every chance we get. We packed our stainless steel water bottles (NO plastic or BPA) for the trip, so we would always be hydrated and not have to buy throw-away plastic water bottles. We brought them to the airport empty, and filled them up at a water fountain after passing security and again after landing. Once in our villa, we filled them with the ready-made ice in our freezer, water from our tap (sometimes we mixed in lemonade, tea or freshly sliced fruit) and had wonderfully cold drinks, wherever we went. My husband is a big fan of fruit infused water and wants us all to migrate from stainless steel water bottles to fruit infused water bottles. We tried to bring whatever we could from home so we wouldn’t have to buy it and leave it in Sarasota. 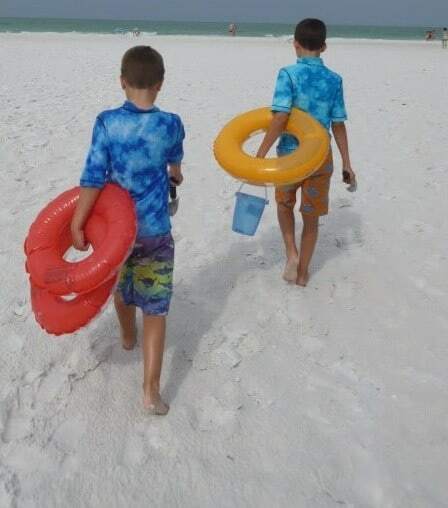 Because we were able to check our luggage for free (Thanks Southwest Airlines), we brought deflated rafts and swim rings, a bucket and two metal hand shovels for the beach. We brought beach towels from home. We brought our sunglasses, hats, swim shirts, sunscreen lotion (Up & Up Target brand is our preferred sunscreen) and everything else we would need that we already owned instead of buying it while on vacation and then throwing it away afterwards. We returned with all our items as well. The Villa also has a selection of beach items for guest usage as well. Because we stayed in this villa instead of a hotel, we were able to buy our own groceries. We ate a lot healthier and saved a lot of waste from the landfills. Think of the “free breakfasts” at hotels with all of the polystyrene plates, plastic drinking cups, plastic cutlery and paper napkins. By buying our food at a grocery store at the beginning of our trip – even before we stepped foot in our villa – we saved gas by not having to drive to all of the restaurants each day. We ate just two meals in restaurants the entire trip and one was on the last day at the airport. We recycled everything we could in unit’s convenient bin right outside our door. We left it at the curb, and the maintenance staff emptied it daily. We even managed to save some water by rinsing out our swimsuits, towels and sandals a few of the times it rained. We just hung them on the drying rack and left them outside for a few minutes during a downpour! The unit has a washer/dryer but we did not use the washer and had no need for the dryer because of the screened covered porch. We brought library books instead of buying new books. The clubhouse even had a nice selection of books to share, borrow and return. Don’t bring library books to the beach; however, because sand sticks around! Other going green vacation things, but obvious ones: We ate snacks on the beach once and carried all of our trash back with us. We didn’t feed any seagulls or other wildlife. We didn’t pick up or disturb any marine life we saw. Finally, in our quest to be going green vacation, and because we wanted to maximize our time at the beach, we didn’t go to any commercial tourist attractions. This was a “nature only” trip, and we all loved it. Another reason this villa worked so well for us, my boys are very picky eaters. We also deal with milk, egg and tomato allergies. It is often a hassle to get ready to go out to eat, much less going 2-3 times a day. When we stayed in villa 14C, we were able to buy healthy choices for our kids and only buy in the quantity we could and realistically would eat. The owners had everything we needed in the kitchen to prepare everything we bought to eat. We were also able to reduce waste by washing our own plates, cutlery and glasses. We loved every 156 glorious step to Crescent Beach on Siesta Key! What a convenience to not have to drive and find a parking spot to enjoy this picture-perfect, white, clean sand. The sand is not made from coral, as most beaches are, but from quartz so it’s always cool to walk on…never HOT! It was easy to walk on because while there were lots of beautiful shells, they were not crushed up and rough on your feet like at other beaches. The sand was cool to the touch and enjoyable to walk on. I love how everyone left their shoes right on top in the grass by the stairs before walking onto the lush sand. There was a tall shower and a foot shower by the exit. It was perfect for rinsing off the sand and salt water. I really loved how the showers turned off immediately when you let go of the button. Casa Blanca also had a lot of lounge and upright chairs for the residents and guests to enjoy at the beach. I didn’t see a lot of garbage, but I did meet a nice older gentleman picking up trash along the shore. But instead of treasures, I saw he had a bag of garbage. He did this almost everyday as doing his “part for this beautiful community”… and get some exercise. We also loved looking for shark teeth (or as my boys and husband kept calling it “Shark Teeth Hunting” in funny Cajun accents). We went to Casperson Beach and also to Venice Beach. 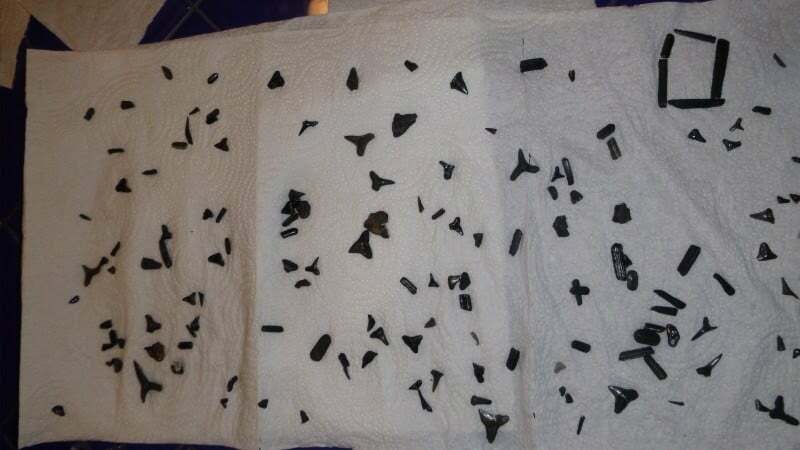 Each time, we found at least 10 -20 shark teeth and/or tips. Sometimes it was easier than others, depending on the tide and how fast the waves pushed them up onto the shore. At the end of each day, the boys would clean, dry off and organize the days shark teeth and other finds. The boys would spend hours every evening studying and discussing their finds and try to determine what it was, what it came from and/or shark kind of shark the teeth were from. We had our best luck looking without the sifters and shovels. We did rent the ‘sifter shovel’ one day from the bait shop on the pier by Sharky’s. My husband got the last one when we got there around 4 pm. We found three teeth right away using it, then nothing the rest of the evening. 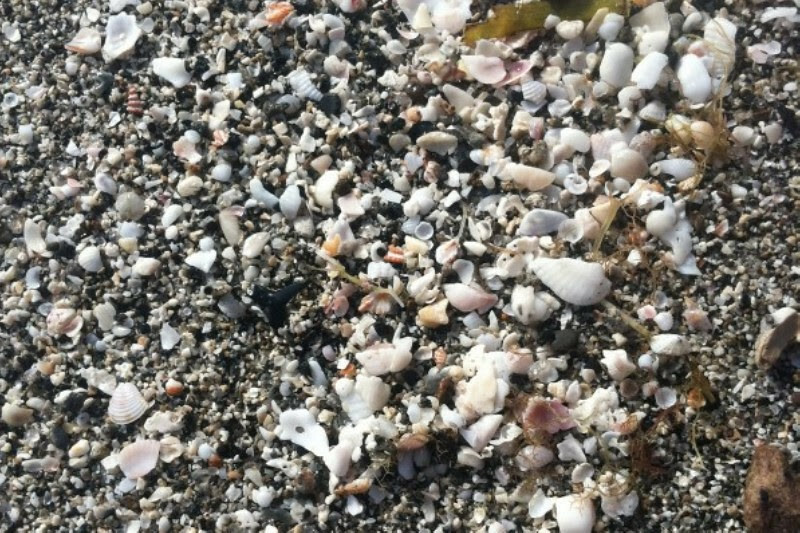 We had the most luck just walking the shore and looking in the washed up piles of crushed shells. 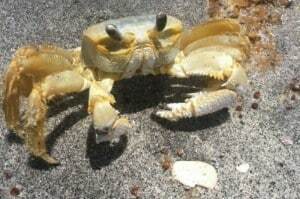 At Casperson Beach, many people were finding them along the big rocks that lined the shore. We were unsuccessful finding them there and had our best at the beach just north and south of Sharky’s By The Pier. Sure, we know what shark teeth are supposed to look like but it really helped us to actually see them. So, after about an hour of not finding any, we asked a few people to see what they found. 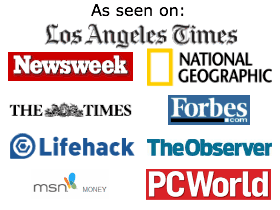 It helped us immensely to see what we were looking for! Right after that, we started finding them ourselves. It was helpful to see both the shark teeth and the shark tooth tips. Train your eye. I read before coming to Venice Beach and Casperson Beach about “training your eye” to only look for the black. It really helped to filter out the seaweed, rocks and shells, and we found the shark & barracuda teeth, tips and stingray barbs much faster. It was addicting looking for them! It was so nice to see how fun it was for everyone – young and old. We had a fantastic time on our Florida vacation and cannot wait to return. We would do the exact same thing again, including staying at Casa Blanca, villa 14C. It was a vacation home which offered us exactly what we were hoping for and more. We have had fun looking at our shark teeth, measuring them, organizing them by type and trying to figure out what kind of sharks they are from. What wonderful memories my sons will have whenever they look at their prized shark teeth. And they learned about and enjoyed really simple ways to having a Going Green Vacation and live green even while on vacation. We thoroughly enjoyed hunting for shark teeth and can’t wait to go back. Be sure to read about how we hunted for fossils and hunted for diamonds too. There are few more universal traditions in America than an annual family vacation. For eco-minded consumers, vacations can be a difficult situation. We all want some time away from work and commitments at home, yet we hate to let our recreation create too much cost to the planet. Hotels, in particular, are unappealing to environmentalists, because they create more waste, use more utilities, and contribute to urban sprawl and traffic. For the eco-minded consumer, then, a beach home represents a far more appealing option. But just buying a beach home isn’t enough. In the right parts of the country, the value of avoiding hotels can be compounded by other factors. It’s important to think about several areas of overhead when you consider a vacation site. For example, how much cost–both financial and ecological–will be associated with getting there? If the trip to your vacation home requires too many miles on the road, it’s not a good choice. Then there’s the matter of traditional overhead, things like utilities. While the house itself will play a big part in its power consumption, its location will as well. Since beach houses are all located in areas where it gets hot, you can’t hedge with climate. So that leaves the utility market. In an area like Galveston Beach, these factors come together. Texas has a deregulated electrical market, which means your place at the beach can be powered by an electric company in Houston, one that you can choose based on their rates and their environmental responsibility. As for travel, it’s cheaper in Galveston, too, since you can fly into Houston and reduce your driving. The most popular vacation destinations are typically crowded. If you love hustle and bustle, they’re just the place for you. But for people who prefer a more sedate vacation, the quieter locales are more appealing. 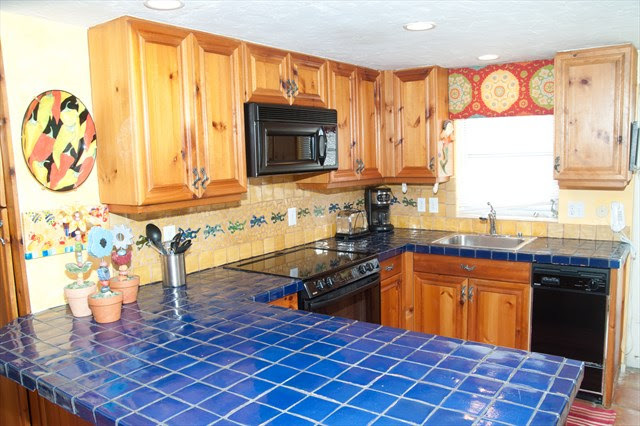 Beach homes are typically situated in the less-crowded areas. After all, the beaches with the highest traffic are typically armored with high-rise hotels on property far too valuable for single homes. A good example of one in the middle is Wrightsville Beach, North Carolina. The area has enough restaurants, festivals, and shopping to cover your rainy days, yet its beaches are free from excessive crowds. It makes for a safer, quieter vacation. Remember that traffic is an archenemy of fuel economy. If you’re stuck in bumper-to-bumper traffic just to go a couple miles for dinner, you’re burning far more gas than you would with less congestion–or with restaurants in walking distance. In 2010, an oil spill from an offshore drilling rig coated much of the Gulf Coast with a thick layer of crude oil. While remarkable progress has been made in the cleanup, the impact on animals and plants is still going on. It may seem illogical to suggest a damaged area like the Gulf as a prime destination for eco-minded travelers, but it actually makes sense. The market is still soft, as many of the homes have been on the market for a long time. And there are environmentalists involved in every part of the recovery, assuring you that a healed Gulf will be perhaps the best-managed beach, in environmental terms, in the entire country. And your investment will help. If the community is seeing revenue come in as a payoff on their efforts to become greener, their determination to remain green will persist. And there may even be volunteer opportunities while you’re in town. There’s no question that travel creates an impact on the environment. But just as we can reduce our carbon footprint in other parts of our life, we can reduce the environmental damage that can be attributed to our travel. Buying a beach home is a great start, but buying a beach home in the right place is even better. Miami is a southern city in Florida known for gorgeous weather, awesome beaches, diverse cultures and exciting attractions. It is an outstanding place to take a Family Adventure Miami. 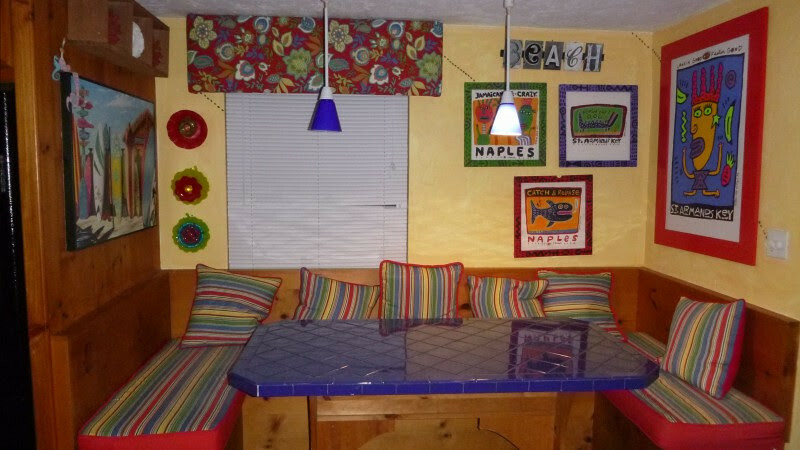 If you are looking for some great cheap family friendly hostels in Miami. The Miami zoo is home to more than 2,000 exciting animals, including tigers, elephants, kangaroos, rhinos and lions. The zoo also features a gorgeous assortment of flowers and plants. Strollers can be rented, or you can ride throughout the zoo on the monorail. While taking a tour of Asia and Africa, you can enjoy a tram ride. You can see feedings of the animals, and you can have the opportunity to meet the zookeeper. It is open every day of the year, and a favorite among children. You will be amazed at the beauty of these breath-taking gardens. You can ride the tram and learn interesting facts about the gardens. The kids will love the butterfly garden where they can see huge butterflies flying around the garden. These creatures will just land on your shoulders, and they are fascinating to watch. You can take pictures of birds, lakes, plants, art and crocodiles. In addition, you can wander through the rain forest and view cascading waterfalls, tropical trees and gorgeous plants. The gardens are open throughout the year except Christmas, so bring your family to enjoy this stunning site. This amazing museum features an excellent collection of artwork and historical artifacts. This palace, located near the ocean, contains exquisite architecture and unmatched beauty. You can visit this majestic museum anytime of the year, and it will be an unforgettable experience. 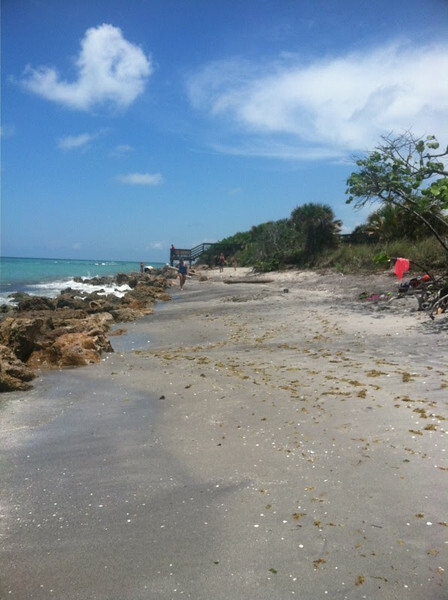 You cannot visit Miami without taking your family to one of the gorgeous beaches. The Miami Beach, the Hallandale Beach and the Niki Beach offer numerous activities along the magnificent Atlantic Ocean. You can swim, build sandcastles, eat or just enjoy the scenery. The atmosphere is breath-taking. January through April is the best time of the year to visit the beaches in Miami. Situated on Biscayne Bay, this fascinating place is home to giant sea turtles, manatees, killer whales, dolphins and coral reefs. 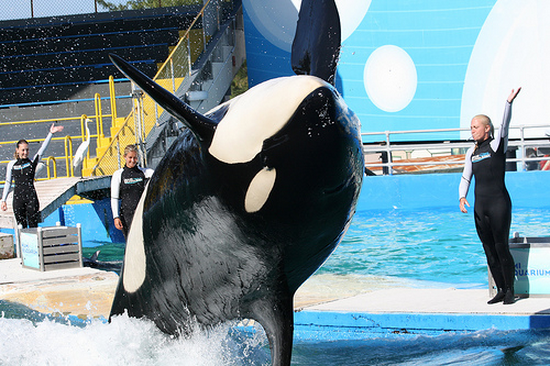 You can see amazing dolphin and killer whale shows, and you can even swim with the dolphins. It is open every day of the year, and reservations can be made to experience the animal encounters. The whole family will enjoy this tropical paradise. Miami is famous for its gators, so your family will have a blast while visiting this interesting park. You can see birds, turtles and alligators. The air boat ride is amazing, and you can even hold a small alligator. It will be an enjoyable experience. This exciting theme park allows you to experience unique animal encounters. You can see orangutans, snakes, lizards, frogs, kangaroos and more. You can visit the park any time of the year. This hands-on museum is great for kids. They can operate on a fake animal, get to be a dentist, see a fire department and visit a police department. Children can explore a television studio, or they can visit a supermarket and bank. They can also visit the cruise ship area. Kids can rock climb, dress up like a fire-fighter and learn about the Olympics. The museum features a great view of the port of Miami. It is open year-round with the exception of Thanksgiving and Christmas.